A couple of weeks ago I spent a weekend in Paphos with J and his parents. We like to visit every couple of months however, this was a specific visit, incorporating the celebration of three birthdays (mine, his father’s and his mother’s) and our two respective wedding anniversaries (one the day after the other). Given the celebratory reasons for the visit we ate out on Saturday evening and Sunday lunchtime, at two different restaurants. Jay and I also had lunch, with a friend and colleague of mine, on Saturday. Three restaurants in two days is a bit of a record for us and as they were all very good I decided they deserved mentioning. I’ll address them in chronological order, just so that I can keep them straight in my head. On Saturday, while driving into Kato Pafos, I called a friend and asked if she would like to join us for lunch. She agreed and we arranged to meet at Captain’s Bistro (not to be confused with Captain’s View upstairs), on the promenade. Jay and I both like this place and have done since our arrival here, over two years ago. Generally, J and I prefer to avoid the ‘tourist trap’ cafés and restaurants however, this bistro is frequented by Cypriots and tourists, which we take as a good sign of quality and value. This café/restaurant provides a wide range of dining and refreshment options starting from just a drink to quench the thirst, a ‘coffee and cake’ snack, light lunches and a full meal, including appetisers, mains and deserts. The menu has a mixture of Greek/Cypriot dishes, Mediterranean styles and British foods (and a children’s menu), all of which are reasonably priced and of generous proportions. As we knew we would be eating out that night J and I both opted for a light lunch, he had a single cheese burger and I had the club sandwich, while my friend opted for the Caesar salad. Given the size of the portions all three of us took our time, we weren’t ushered out of our seats, nor were we constantly bombarded with queries from the staff. However, when one of us had finished our drink a waitress appeared almost immediately. All of us enjoyed our meals, I was almost defeated by my club sandwich, salad and chips. The bread was lightly toasted, the filling ingredients good and well-cooked, and tender (no skimping or empty bread), the salad was fresh and crunchy with succulent tomato and cucumber, and the chips (of which I ate few) were crispy, golden and fluffy in the middle. My friend didn’t quite manage to finish her Caesar salad with chicken (but only leaving a few lettuce leaves and a slice of tomato) The chicken was tender, the dressing tasty but not too rich and the salad fresh (see above). Given my hubby’s size and build, it is ironic that his serving of hamburger, salad and chips was the smallest of the meals. However, I gave most of my chips to J so he did receive ample sustenance. From experience, the meat in a hamburger is generally pork and the burgers are well made and of more than adequate size to fill the bun. They are made either in house or locally, with fresh herbs and are succulent and juicy. In addition, the cheese is ‘real’ cheese, as opposed to processed ‘cheese’ slices, which taste like processed plastic rather than anything that came from a cow. J rarely eats salad unless forced to but that fact that he ate almost all of it (he hates cucumber) is a testament to its quality. 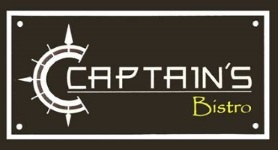 Captain’s Bistro is casual, welcoming and an ideal spot for a break when walking along the sea front. The staff are friendly and helpful, the food good and value for money, and its position on the sea front, along with canopies over all of the tables, allows for a respite from the sun and the opportunity to take advantage of any breeze from the sea. As we were experiencing a heatwave, the presence of fans was also appreciated. If you are of the techno addicted crowd, there is also free wifi, if you ask for the password. Our adventures to be continued… Tomorrow. This entry was posted in Articles and tagged good food, Paphos food, restaurant review by Mamie. Bookmark the permalink.